Tough year for me, overall, despite some blessings and happy times. This posting isn't about food but why have a blog if you can't use it to sum up a challenging year in your life? I have found greater comfort in God than in many years prior -- and also found a new church that I like a lot. In March, the healthy foodie was shocked to learn that she had two arteries that were at least 90 percent blocked. I ended up spending 5 nights in hospital and getting 4 stents in those two arteries. I'm on all the meds now to keep my heart healthy. The cardiologist said there was "nothing" that I could do different, habit-wise, to improve my chances for no recurrence. In other words, my lifestyle is heart healthy, my genes are not. My mother fell and broke her arm in January. She went into nursing care (from an assisted living apartment) and then the facility informed us that she would have to spend the rest of her life in nursing because of her advancing dementia. Over the summer and without my knowledge, my husband's drinking got out of hand and he got into trouble with the law. He was arrested in September on a felony charge, and convicted early this month. Since Sept he has been on house arrest awaiting his (our) fate. His crime was on local TV and on the front page of our city's newspaper. I never could have imagined such a thing. Here are a few thoughts about how to make the evening fun, safe and healthy. 1. If you drink alcohol, drink bubbly on this night. One of my favorite at-home celebrations is to invite couples to bring a bottle of bubbly and I'll provide the food. If you invite wine-savvy people, some interesting stuff will show up and it's a treat to compare various styles of sparkling wine. I am partial to Champagne, the real stuff from France, but there's a lot of variation there too and I like to try different styles of Champagne. 2. When you don't want to spend $$$ on Champagne, buy another type of sparkling wine and make "champagne cocktails." To cut back on alcohol consumption, mix your bubbly with orange or cranberry juice. 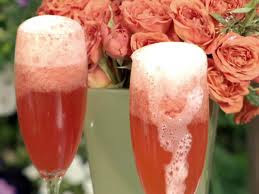 Or pour a little Chambord (raspberry liqueur) or Grand Marnier in a flute and top with the sparkling wine. These drinks are just as festive as straight Champagne, sweeter (which many people prefer), and might lessen any ill effects on New Year's Day--also known as a hangover. 3. Be vigilent about drinking and driving: don't do it. There are ways to get around having to drive after you've imbibed, and you really have no excuse to get out on the roads in the early morning hours when you're impaired. My strategy of choice is to host a party at home, usually with guests who live in our neighborhood and don't have far at all to travel--some can walk home, even. Find a way. 4. Eat mindfully. By this point in the holiday season I am completely stuffed with extra calories from things I normally do not eat. 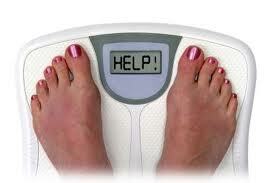 I haven't gotten on a scale lately but know that a few pounds have piled on that I need to be getting rid of soon. For me, New Year's Eve may not be a diet day, but it's also not going to be an overly indulgent one, either. Here's a roundup of the biggest food news of the year, and how these developments can affect our health (in a good way). 1. New Health Care Law includes requirements for restaurants to post calorie counts on menus. Whatever else the health-care overhaul did or did not do, one result is that it should help diners know what they are eating. 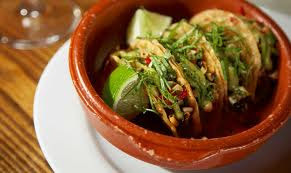 Eating out is probably the biggest diet-buster in modern life -- something I love to do, by the way -- and when the FDA writes the new rules in 2011 about what restaurants have to divulge, this will be a good thing for our waistlines. Of course, we can choose to ignore the information, but we'll have fewer excuses. 2. U.S. Senate passes Food Safety Modernization Act. All those food recalls in 2010 were scary, especially the recall of millions of eggs after more than a thousand people got sick from eating contaminated eggs, serve as a reminder that our FDA lacks the authority it needs to keep our food supply safe. This bill is not law yet -- it has to be reconciled with a more stringent bill passed earlier in the House -- but let's hope the new Congress does the right thing and finishes this important work. 3. New York City asks food manufacturers and restaurants to lower sodium content of foods. This is not a requirement, but a request: that sodium be reduced by 20 percent in most foods over the next five years. Since most Americans consume way too much sodium, anything that makes us more aware of the need to cut salt intake has to be a positive development. 5. "Meatless Monday" trend encourages less meat consumption. I try to limit red meat to once a week, at most, and have a couple of totally meatless (and fishless) days per week. Consuming less meat is good for the environment and our health, among other things. So this is another very positive trend that gained steam in 2010. The late, great Southern chef Bill Neal perfected shrimp and grits at his wonderful Chapel Hill restaurant, CROOK'S CORNER (which by the way is still going strong and serving marvelous food many years after Neal's death). His recipe has wide currency in many Southern kitchens. Last week I had some in Raleigh at a restaurant called NoFo, the result of which is pictured above. Click here for the recipe, should you care to try this at home. Beware, though, it's not exactly health food. I spent last weekend with my brother and his family near Raleigh NC and we took the opportunity to eat at Durham's renowned Magnolia Grill. Chef Ben Barker is a past James Beard Award winner, the restaurant was named #11 in the country on Gourmet Magazine's list of America's top 50 restaurants, and pastry chef Karen Barker (Ben's wife) makes some of the best desserts you'll ever eat. I have dined at Magnolia a few times over the years, but not at all recently, so we made the pilgrimage and had a pretty near perfect experience. The ambience is not at all formal or stuffy, and diners feel welcome and comfy enough to linger over the fascinating menu and lovely wine choices. Dark chocolate waffles with peppermint stick chocolate chip ice cream and chocolate sauce. 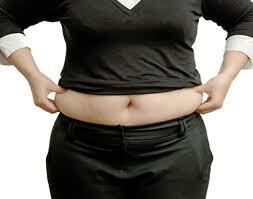 The worst place on your body to accumulate fat is around your belly. Extra inches on the waist is the most dangerous kind of fat, inviting heart disease and possibly shortening your life. A new study reporting in Real Age suggests that the best way to "banish belly fat" is perhaps the opposite of what you might think: don't starve yourself, don't get obsessive about everything you eat, and don't keep a detailed food diary. Instead, EAT! The study showed that women who followed a strict, low-calorie eating plan for several weeks experienced a spike in stress hormones, which actually tell your body to store more fat around your middle, just where you especially don't need it. Go here for tips on how to manage your weight healthfully and avoid putting inches on your stomach. Don't forget Cincinnati's downtown gem of a market for your holiday gift shopping. Despite the cold, there are plenty of local vendors this weekend and next week. Pictured here are some goods I saw Saturday morning. Most of these folks will be there on Sunday and all of next week, through Christmas Eve at about 3 pm. Santa works for Blue Oven Bakery -- peerless artisan breads -- and that's his real hair and beard. The handmade soaps make lovely, fragrant stocking stuffers. There's some unique jewelry, baked goodies of all kinds to serve your family, and delicious locally made foods for gifts or for your own enjoyment. If you make the pieces small (as in the recipe), it goes a long way at a party. If you have just a few people to feed, I love this preparation as a dinner appetizer, a side dish with fish or chicken, or a vegetarian main course. Preheat broiler. Coat a baking sheet with cooking spray. 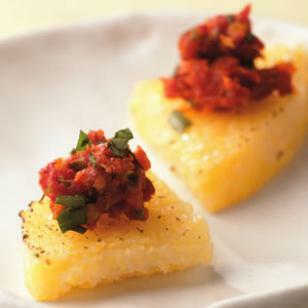 Place polenta slices on the prepared baking sheet and coat with cooking spray. Broil in upper third of oven until starting to brown, 8 to 12 minutes. Turn and broil until lightly browned, 3 to 5 minutes more. Meanwhile, pulse sun-dried tomatoes, oil, parsley, capers, garlic and pepper in a food processor (a mini food processor works well), scraping down the sides as needed, until coarsely chopped. Transfer the polenta slices to a clean cutting board and cut each into quarters. Top each wedge of polenta with about 1/4 teaspoon of the tapenade. BEST TIME TO EXERCISE: before breakfast? This is really interesting news, as published in the NY Times this week. Apparently, getting your workout in the morning before you eat can help counteract any over-indulgence you may have committed on the previous day. Here's part of the article, and go here for the whole thing. But a new study published in The Journal of Physiology suggests a more reliable and far simpler response. 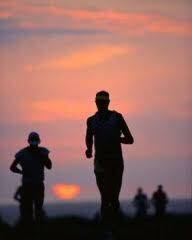 Run or bicycle before breakfast. Exercising in the morning, before eating, the study results show, seems to significantly lessen the ill effects of holiday Bacchanalias. The best meal (by far) I had in Atlanta last weekend -- and one of the highlight dinners of the year, anywhere -- actually was at a restaurant in Decatur, GA, just outside Atlanta. It's about a year old and is on Decatur Square, a rather marginal area full of lesser eateries, none worth going out of your way for, as far as I can tell. But what a foodie gem sits among them! 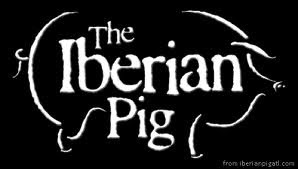 The Spanish themed Iberian Pig Kitchen & Bar has two dining rooms, one on the main floor adjacent to a hopping bar, and another smaller one on the second floor. We went on Saturday night and the decibel level was over the top, making me leery of what this experience was going to be like. We had a reservation and were ushered right to our upstairs table. The wine list boasted many unusual, adventurous choices, heavy on selections from Spain, of course. Since my knowledge of Spanish wine is not deep, I trusted the waiter to bring me glasses (or 3-ounce tastes) of whatever he thought would match my food, and he did really well. The wine was excellent. But the food -- amazing! To start, I had what turned out to be the best salad I've tasted in many moons. Called Ensalada de Marcona, this scrumptious concoction included butter lettuce, delicious Marcona almonds, cherries, shaved Manchego cheese, chorizo, caramelized parsnips, crispy shallots and sherry vinaigrette. Lick the bowl good. My friend's braised veal shank ravioli, a tapas portion, was so wonderful that she ordered a second plate of it. I was on a roll and didn't want to quit eating at this place, so I ordered dessert, too: a trio of ice creams -- pistachio, fig & sherry and dulce de leche. I would go back to this restaurant in a minute. HIGHLY recommended, anyone who will be in Atlanta anytime soon. It's near a subway station so even if you don't have a car, you can get there on MARTA. Do it! Go ahead, have a cookie! Go ahead and have a cookie, or maybe two. The idea is, trying to stifle a craving just makes it bigger, and eventually you won't be able to resist. Then you'll eat far more than you should. So it's way better to have 1-2 cookies now than a dozen or more later. A study of female college students found that when they were asked to sit alone for a few minutes and think about chocolate, avoid thinking about chocolate, or think about whatever they wanted to, when they afterward were given chocolate, the ones who ate the most were those who had been told to NOT think about the stuff. Here are a few tips (from Real Age) about when to give in to a craving. Pick your battles. The longer your standoff with that chocolate-peppermint bark, the more dramatic your surrender may be. Allow yourself an occasional, sensibly sized treat. And afterward, don't feel bad, advises RealAge expert Keith Roach, MD. "Okay, you had the cookie. Now, don't beat yourself up about it," says Dr. Roach. "Because if you do, you're more likely to do something you'll really regret. Instead, actively enjoy -- and don't feel guilty about -- eating that cookie. Then, go make your home beautiful for the holidays." We spent most of the day at Chateau Elan, about an hour's drive north of Atlanta. It used to be the middle of nowhere up there but now of course the winery/hotel/golf course/spa complex has plenty of company. We had lunch -- photos are of me and my friend Susan at table, and the crabcakes we both had -- and then our spa treatments, followed by hours of relaxation (whirlpool, sauna, lying around reading or dozing, etc.) and then a 45-minute hike on their wooded trails. We topped it off with a light tea before driving back down to Atlanta. 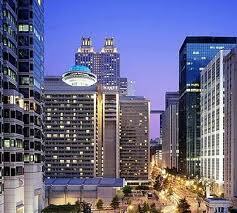 I'm in Hotlanta for the weekend, doing restaurants and a spa. Details, and photos, coming soon! From the NY Times health pages this week, a version of pasta fagioli that you can make any night of the week because all the ingredients should be in most folks' pantries -- canned tomatoes, canned white (cannellini) beans, dry pasta. It's a breeze, and a palate pleaser. 2. Meanwhile, heat the olive oil over medium heat in a large skillet or saucepan. Add the onion. Cook, stirring, until tender, about five minutes. Add the garlic, and stir together until fragrant, about 30 seconds. Add the tomatoes with juice and a pinch of sugar. Raise the heat slightly, and cook, stirring, until the tomatoes are bubbling vigorously. Lower the heat to medium-low, and cook gently, stirring and mashing the tomatoes often with the back of your spoon until they have cooked down into a thick, fragrant sauce, 15 to 20 minutes. Stir in the beans and the herbs, and season to taste with salt and pepper. Keep warm. 3. When the pasta water comes to a boil, salt generously and add the pasta. Cook al dente, following the recommendations on the package but checking about a minute before the indicated time. When the pasta is just about done, check to see if the tomato sauce seems dry. If so, add up to 1/4 cup of the pasta water to the pan and stir. Drain the pasta, toss with the sauce and serve, passing the cheese for sprinkling. Want to stay faithful to your diet or lose more weight? Eat a handful of nuts when you get the munchies. Despite their high fat and calorie count, nuts are the perfect diet food. Research shows that people who eat nuts lose more weight and are more likely to stick to their weight loss plans than people who don't nibble on this ultra-satisfying munchy. Nuts boost weight loss efforts in three ways. First, they satisfy hunger, helping people to eat less later. Second, research shows that eating nuts helps people burn more calories at rest. And finally -- because of how the body digests them -- nuts might actually deliver fewer calories than you think (in fact, fewer calories per serving than nutrition labels suggest). Yep, sounds like nuts just might be the superfood of all superfoods. Find out what eating nuts once a week can do for your eyes. Discover what nut is best for heart health. Pair nuts with this treat and you'll probably live longer. I actually meant to add meat to this "pasta" dish (in quotes because it was spaghetti squash and not true pasta) but forgot. 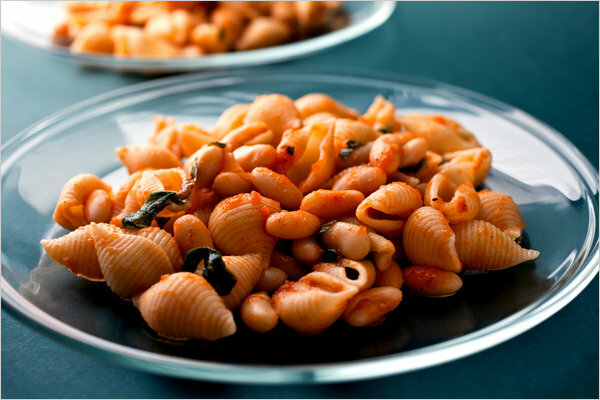 To give it some protein, I sprinkled shredded Parmesan cheese and toasted pine nuts. This is a very healthy meal, and super easy. Serve with crusty bread and a crisp white wine of your choice. If you prefer red wine, go for it. Carefully cut the squash in half lengthwise. Scoop out the seeds and pulp in the middle. Using a fork, scrape the meat out of the squash -- it will come out in strands not dissimilar from spaghetti. Season the squash with salt, pepper and little olive oil if you want. Put in a bowl, cover and set aside. Meanwhile, heat canola oil in a large skillet over medium high heat. Add zucchini, pepper, garlic and mushrooms. Cook, stirring frequently, until vegetables start to tenderize, about 5 minutes. Add tomatoes, water and seasonings. Reduce heat to medium-low, stir well, cover and cook for another 4-5 minutes. Reheat squash in the microwave for 30 seconds and divide among serving plate. Spoon vegetable sauce over squash. Sprinkle with pine nuts and cheese; pass more cheese at table. Whether you're thinking about throwing a party, or giving wine as a gift, here are some thoughts about how to get your best bang for the buck with your wine purchases in December. 1. Buy by the case. When you find a wine you like, get more than one bottle for yourself and for gifts. Most wine shops will allow you to mix a case (12 bottles), not just buy 12 of the same one. In either option, you will save 10-15 percent over the by the bottle price. 2. Look for wines with screw caps. I am a huge fan of this type of closure -- great for parties because you don't have to mess with a corkscrew, and frankly, I love the ease of opening for drinking with dinner at home, too. Some types of wines are mostly screwcaps, including two of my faves -- New Zealand sauvignon blanc and Oregon pinot noir. 3. Select food-friendly wine varietals that will satisfy a range of tastes. Click here for some ideas. 4. Look for affordable sparkling wines. These make great party choices, too. Try Spanish cava, Italian prosecco, or one of my favorites, the New Mexican (yes) sparkling wine by Gruet. 5. Use inexpensive bottles for punches. It's only a couple of pounds, but they are being stubborn about going away. Two pounds may sound trivial but my philosophy has always been to nip these things in the bud before two turns into five turns into ten.... and so on. Also the older I get, the harder it is to drop even a couple of pounds. This week I've been pretty good -- no alcohol, one of the first tactics I turn to when trying to lose a little weight. No extra treats such as cookies. Only healthy snacks. Really diligent on the exercise. And thus far, my bathroom scale shows just one-half pound less than on Monday morning. Guess I'll have to redouble my efforts...........doggone it!